This music video follows much of the same pattern as Bruce Connor's "Movie," the short film we watched in class: bizarre images from spectacles and popular culture smashed together into a whimsical weird montage. In that film, music often contrasted starkly with image to create a witty feel of ironic tension. (Witness men falling off jetskis while somber high-drama music blares on in the background). Much of the same technique is employed by Connor here. This time Devo's "Monogloid" makes up the entire soundtrack though. The song, with it's ironically simplistic chord progression and bleating vocals, makes the perfect contrast to 50's images of smiling men in lounge chairs, a man pulling a bus with his teeth. 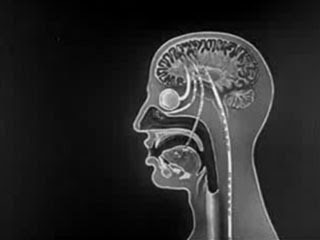 Much of the video is filled with old imagery that looks like it could have come from a television special about how the brain works. We see people's heads attached to wired caps, animations of crossing lines perhaps meant to look like neurons, and a sketched cross section of the human brain's reaction to a plate of food. There are also recurring images of bucolic suburban life: waving to the post man, people wearing cardigans, reading papers happily behind desks, clips from cereal commercials, etc. While these images on their own might be difficult to assign meaning to, with the aid of Devo's self-conscious irony, they become instead witty commentaries on what it means to be really brain dead. I like this films editing and use of archival footage to tell a new story separate from those recorded events.